There is absolutely nothing like these Moroccan Beef and Lamb meatballs. Seriously, they take amazing to a whole new level. They are tender, succulent, full of spices and a complete game changer when it comes to meatballs. This recipe is an absolute favorite in our house. And I’m not exaggerating. Every time I make a batch, I triple the recipe and freeze some. They’re perfect to whip out for a quick meal and they’re so tasty that it’s perfect having some to reheat quickly. I’ll often eat them plain with the tzatziki sauce, but my kids love to have them stuffed into a pita and topped with the tzatziki and a cucumber tomato salad. It’s the perfect combination that is seriously mouthwatering. If you’re not feeling like gyros with meatballs, don’t worry! This one is perfect for grilling on skewers as well. These meatballs are amazing on their own but grilling them takes them to the next level. There is something about the smoky flavor of the grill that really makes meat exceptional. Moroccan Beef and Lamb meatballs are great for the summer. They’re perfect to take with you to picnics and potlucks. Your friends will love you for bringing them to your 4th of July BBQ. The hotdog and burgers will be blown out of the water! The combination of the lamb and ground beef is wonderful in these meatballs. But what really sends them over the top is the spices. We’re not talking about just the usual garlic, onion, salt and pepper either. Moroccan foods tend to be filled with delicious and vibrant tasting spices. Paprika and cumin are very commonly used Moroccan spices and they get put to good use here. The traditional Moroccan paprika is a sweet paprika made from dried sweet red peppers. It’s used to season meat, beans, soups, stews and even salads. Cumin comes from a plant in the parsley family. The fruit is dried and ground to make the cumin. It’s very aromatic and tends to give food a very earthy and warm flavor. It’s commonly used in curries, meats, beans, soups and stews. You’ll also find fresh parsley, cilantro and mint in these meatballs. Parsley is frequently used as a garnish in Western cultures, but here it helps to round out the flavor of the meatballs. Cilantro is another fresh herb that comes from the same plant as coriander. Don’t mix them up however, they’re radically different in flavor. Cilantro has delicate green leaves that are very similar to flat leaf parsley but are much stronger and brighter in flavor. 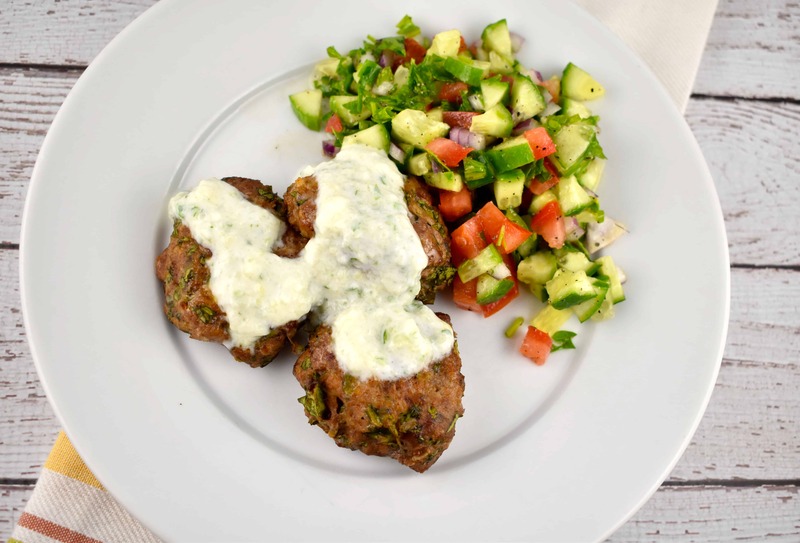 Mint is the final fresh herb that rounds out the flavor of these delicious Moroccan Beef and Lamb Meatballs. It’s bright, clean and refreshing, and adds that hint of a pure and sweet fresh flavor to the meatballs. It’s no wonder these meatballs are such a hit in our house. They are the most tender, juicy and flavorful meatballs you’ll ever have. They’re just a few points per serving and, seriously, this one’s a MUST make. The most tender, juicy, and flavorful meatballs you’ll ever have. It’s an easy recipe that delivers an incredibly delicious dish with traditional Moroccan flair. Preheat oven to 400 degrees. Line a rimmed baking sheet with parchment paper and mist with nonfat cooking spray. In a bowl, combine all ingredients, mixing well with hands. Form meat mixture into 20 1” meatballs. Place meatballs on baking sheet, and place in oven. Bake for about 18-22 minutes, or until meatballs are cooked through and no longer pink in the middle. OPTIONAL: Serve on a whole wheat pita with tzatziki sauce (my version can be found HERE) and some cucumber tomato salad (my version HERE).